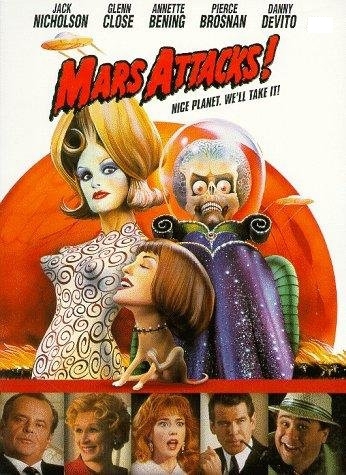 Mars Attacks!. Warner Bros. Pictures 1996. I’ve always expected this film to be modern camp. A film with modern sensibilities and humor that’s unashamed to be cut from the same cloth as old-fashioned B-movies. That’s the story sold by the advertising anyway, which isn’t always the most trustworthy. This is definitely offbeat, but it doesn’t seem like Tim Burton’s style of offbeat. For one thing, it appears to have a distinct lack of Johnny Depp. This must have been one of his last films before he started making the same movie every time. The lives of people around the nation and the world are interrupted when the President announces that a gigantic fleet of saucers from Mars are approaching Earth. Although first contact starts out peacefully, the Martians soon start shooting, massacring most in attendance. It seems like a cultural misunderstanding, so apologies are made and they try again. But all the Martians really want is to just have fun destroying the place, leaving the humans with little defense against their advanced technology. The satire is buried very deep in this film. The only line I really got out of it was in Michael J F0x’s news reporter character, who’s constantly upset that all the juicy news stories are going to the daytime talk shows, not his serious news. I lost sight of anything that looked like political satire after he died. On the other hand, this seems to be not so much a parody or deconstruction of a B-Movie, but a reconstruction. Some of the elements are played for laughs, but most seem to just be treated with a heightened sense of realism. Part of the reason I found it easy to forget this was supposed to be a B-Movie is that the actors don’t play to camp nearly as much as they did in the 1950s. They aren’t playing modern comedic cardboard cutouts, but they aren’t delivering everything with the familiar overly-dramatic yet flat tone. They don’t play it with real drama either, partly because they don’t have time. This is a very crowded movie. Dozens of characters share the spotlight and none get it effectively. For what it is, I consider it a strength though. First, it’s similar to the oodles of characters in some of the bigger B-movies, and second, it allows the large cast of A-list actors to do their bit and get out without spending too much time drawing paychecks. Were it a different kind of movie, I’d also point to the fact that the fact that so many characters have interesting stories that don’t have time to be told properly is also a symbolic point that everyone in the world has their own story of the Martian invasion. This is a film that can’t be reviewed without a note on the visual effects. At times, they really did well recreating old cheap stop-motion animation in the computer. Marching Martians are a good example, as their walk style seems to come more from bad animators of the past than anything else. There were a few shots that, if they really were mid-90s CG and not actual stop-motion, I’m truly impressed. I’m somewhat disappointed to note that some shots seem to have been animated at the full frame rate when others have clearly been rendered at the old style 15 frames per second. They were mostly scenes when the animated characters had to physically interact with the live actors, and probably turned out too bad to let go in half speed. This definitely seems to be a film that requires multiple viewings to enjoy fully. The basic concept is too simple to miss, though. The aliens don’t have a motive more sophisticated than having fun, and neither does the movie. The audience gets to spend two hours playing with ray guns and horribly implausible aliens. It’s not as nuanced a conflict as one usually prefers, but it’s a refreshing change from the modern sci-fi climate, where it seems that the humans can’t even be the good guys when they’re refugees (see Battle for Terra). Watch this movie: for a shoot-em-up with flying saucers. Don’t watch this movie: for deep statements about oppression or nature.